Zabasearch is a free search engine to find information on people including names, addresses, phone numbers, birth year, and more. People search engines have a bad reputation on the Internet because of two things: first, because many are designed to provide information only after users pay money. Second, that the provided information may have been retrieved without consent. The basic version of Zabasearch is free, and using it to search people will reveal some information directly on the site. The service does not require you to register an account, nor does it ask for payment before it displays the information. Advanced data searches on the other hand, like running a background check, searching by phone number, or confirming phone number and address, are provided by the paid service Intelius or US Search. Zabasearch acts as an affiliate of these companies in this regard, and redirects your requests to the other service where you are asked to make a payment before the information is provided. Zabasearch displays several options on its website that allow you to run searches. The basic version is loaded directly on start. You may use it to enter a name, e.g. Bosco Albert Baracus, and may hit search right away, or limit the output to a particular U.S. state. Results are displayed automatically on the next screen. Zabasearch highlights the number of hits on the page, and lists each entry with its name, address, and sometimes even the phone number. Most links on the page link to the paid services Intelius or US Search, but some don't. 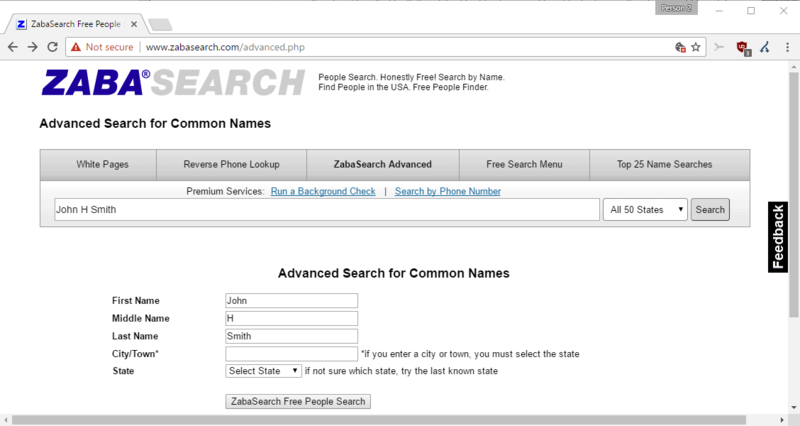 Zabasearch displays a "google" link next to each name that you may click on to run a Google Search for the name. This can be useful to search for additional information using Google. Other search engines are not linked, and you need to run searches manually using them if Google does not deliver the right results. While you may not have any issues searching for less common names such as H.M Murdock, you may run into a large set of data if you run searches for common names such as John Smith. The more you fill out, the more you filter the results. Searches seem capped at 100 in the free version of the search engine. This is a good way of displaying more results, as you can theoretically fill out more identifying fields, or run searches for each state individually. Still, results may still be limited and there is nothing you can do about that in this case. Where is Zabasearch getting its information from? One question that may come up, especially if you notice that information about someone you know or yourself is listed by Zabasearch, is where the people search engine is getting its data from. Zabasearch notes that the information that it displays when users use its search capabilities come from " broad variety of public record sources". The company does not reveal these sources, but hints that it uses public phone book records, property transactions, voter registration records, and information from sweepstakes participation. Basically, any information that is publicly disclosed, be it through the sources listed above, or on Internet sites, e.g. on social networking sites, may be picked up by the company. Zabasearch acts as a search engine, much like Google does in this regard. It is specialized however, as it focuses on people information, but the basic functionality that powers it is identical to other public search engines. Can you block your entry? Zabasearch may suppress some information from users who file a request with the company. As a courtesy we can 'opt out' your specific information from the ZabaSearch People Search service. What this means is that your name as it appears in a particular record and the associated identifying information such as your address and phone number will be suppressed if you request this in the manner described below. However, please note that any time your identifying information appears in a public record in a manner which is different from the record you opted out, it will again appear in our system. (For example, if your address or area code changes your new information will again appear unless you opt out the new record.) There also are many other public records search services which are not owned by ZabaSearch and your request that we opt out your information will not prevent your information from appearing on these other services. In order for that to happen, users need to verify their identity by faxing a valid copy of an ID to the company. The company may need up to 6 weeks to process these requests. You may also investigate the actual source of the information. Zarasearch pulls the information from public sources. This means that the information that the search engine displays has to come from somewhere. If you identify the source, you may be able to change or pull the information so that it is no longer available publicly. Zabasearch Premium is a free premium version of the people search engine that is open to users who connect their Facebook account with the search engine. It provides users with more search results, and should not be confused with the "Premium Services" options that Zabasearch lists on its pages as well. Connecting with Facebook will only increase the results that you get, but won't enable you to run background checks or use the search by phone number feature for free. Zabasearch is a basic people search engine that focuses on the United States exclusively. It returns basic information for free that include names and addresses, and sometimes phone numbers, and the birth year. The advanced search feature allows you to limit results better, as it gives you more options to fill out information that are processed by the search engine. It may be a good entry point for starting people searches, but you may want to use public search engines and other sources next to it for additional information. They just want your money like any other people search engine. Thanks, but I prefer Pipl.com. THANKS ZUINO, PIPI.COM IS VERY GOOD, FOUND OUT WHOM I WAS SEARCHING FOR THAT ZUBA SEARCH DID NOT. I searched myself and the only result was an address I haven’t lived at in over 12 years. Not going to jump through their hoops to get it removed. This classification is assigned to website’s engaged in the distribution of malware (e.g. adware, spyware, trojans and viruses etc). I was hopeful, but this thing is useless. Couldn’t even find me although I am publicly documented as an attorney. A significant weakness of Zabasearch is the absence of the age of the persons it identifies. Age is an important key to narrowing down a search to find the “right” person, especially if the person being searched has a name that is shared with many others. WHY DO U SAY (FREE SEARCH) WHEN IT’S NOT FREE?